As I am back at work, there is no escaping the fact that today should be the first Friday Fun day of 2011. My Friday revolves around two things (ok, three – if you include work) – firstly, that this weekend’s the London A Cappella Festival and I’m off to see the Office Choirs of the Year (including my singing chum Annabelle) perform with the fabulous Swingle Singers tonight. Secondly, Friday is cake eating day. So, the first bit of fun is something to watch, listen to and try out for yourself. It could become a bit of a new year’s project for you. In the previously mentioned T Mobile ‘Welcome Home’ advert, the Swingles (and other similarly talented a cappella people) demonstrated a variety of their skills. Subsequently, the producers of the ad decided to produce a few videos showing these skilled people trying to pass on their talent to (of all people) The Hoff. There are a few other (non Swingle) lessons, including ‘gorilla bass’, and beatboxing. There’s got to be one of those that captures your attention – surely? If you’re really not interested in making weird noises with your vocal chords, could I interest you in some cake? Over the holidays I discovered a considerable number of new blogs (it’s amazing what you’ll read when lying in bed with only your laptop for company). One that’s proved to be a mouth watering hit is The Caked Crusader, a blog of recipes for all levels and palettes. Its most recent post tickled me so much that I figured it could count as fun enough for Friday. Yes, the recipe in question is for a prune cake, but I was less interested in the cake and more intrigued by the recipe book it had been found in. Entitled What’s Cookin’? : A Teen Age Cookery Book, it appears to be something of a 1940s gem, combining Enid Blyton escapades with Mrs Beeton and etiquette lessons. The photo below gives something of an indication of the book’s content, but do check out the original post to hear more gems from its pages. One final cake tip, faithful friend the Hummingbird Bakery launched a new daily specials range last week – reviving some old favourites. As I’ve been on a post-flu recovery diet I felt entitled to two cupcakes in five days, and can therefore recommend both Friday’s Pumpkin Spice and Tuesday’s Nutella – especially the latter, as it has a gooey Nutella centre. Yum. During my recent baking adventures, I’ve discovered a significant gap in the market. When making cupcakes (particularly of the mini variety) there can be issues with storage and transportation – most containers just aren’t space efficient. Too deep a box and there’s tons of wasted space above the cupcakes that can’t be used for fear of damaging carefully decorated frosting. Too large a box can simply be unwieldy and runs the risk of the cupcakes having too much space to roam. It’s quite an issue. After going on a baking spree for my birthday tea I ended up using four or five different containers – not overly practical. What’s needed is a deep, not too wide, container with ledges onto which plastic shelves can be placed at appropriate levels to allow the cakes enough space to be stable yet protected. Imagine a bookcase with adjustable shelves. Sounds pretty sensible, doesn’t it? Surely someone, somewhere would have thought of it already? Obviously (to those of you familiar with British kitchenware suppliers) my first port of call was Lakeland. They do have a ‘cupcake caddy’ that can be used to securely hold large or small cakes, but in my opinion still wastes a lot of space and is rather bulky to carry around – wouldn’t be practical for transporting cakes to work on the tube. Checking other logical stores – John Lewis, specialist baking suppliers – I’ve found nothing. So my question is, does anyone else think this is useful? Should I write a letter to Lakeland in the hope that they’ll create one? [FYI, that’s not as a crazy an idea as it sounds. Lakeland’s well known for responding to customer requests and ideas.] Would anyone else like one? Could someone help me create a proto-type? You won’t be surprised to hear that cupcakes featured heavily over my birthday. There were quite a number of cupcake cards, Mim gave me a 24 hole mini cupcake tin, and birthday celebration #1 was a feast of cupcakes in the park on Sunday afternoon. Gill made glittery cakes while Claire baked fruit-filled beauties (got to get those vitamins in somewhere!) 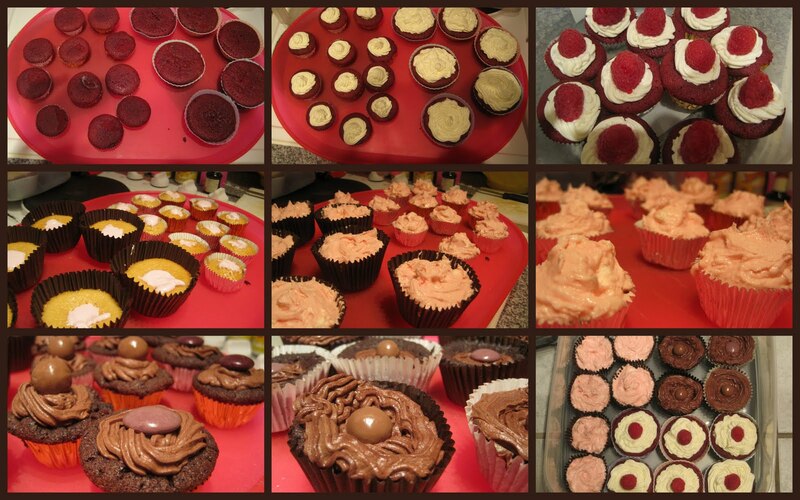 and I made a determined attempt at the title of Cupcake Queen, with three varieties. This was a feat of some organisational skill. Bearing in mind that I’d just spent seven days camping, I didn’t have time to bake the day before – so I baked them two weeks ahead, stuck them in the freezer and iced them on Saturday night. Brilliant forward planning, if I do say so myself. I present to you: Red Velvet and Marshmallow cupcakes courtesy of the Hummingbird book alongside Brownie cupcakes (this recipe, put into cases & frosted). Yep, isn’t it genius? I recently heard about an iPhone app produced by a tea company in the States that enabled you to mix blends and then timed how long the tea needed to mash [that’s Nottinghamshire dialect for ‘brew’, fyi] and finally indicated the colour that the tea should be. Inspired, but I think I prefer this old skool method. It’s little wonder then, that I was suitably impressed with Tea Box – a splendid establishment in Richmond (Richmond is generally splendid, what with its park, deer, shops, river and celebrity residents) that has no fewer than three pages of teas in its menu. Jules and I segued smoothly from lunch (with tea) into afternoon tea (with scones), sampling four different blends between us and having delightful fun with the various bits of tea paraphernalia we were presented with. The photos hardly do the place justice. Their staff were lovely too – I especially liked our waiter overhearing me saying “so I’ve been congratulating myself with a few too many treats…” and replying with “it’s always good to treat yourself” as he presented me with the cake menu. Oh, and their t-shirts said ‘Potty about tea’ across the back, disappointingly I didn’t have the nerve to take a photo. With summer seemingly vanished again, I shall be making the most of my vast tea collection and putting some energy into making it properly – i.e. leaves in an infuser – thus practising the art of tea, rather than simply the consumption of it. Cake #1 was baked by Flatmate (who is an exceedingly talented baker & has set the bar very high for her birthday in September) and was waiting for me when I got up. Yum. Cake #2 was promised to me by myself – a birthday cupcake (because I’ve been denying myself cake for quite a long time). I didn’t want to deny myself, so instead bought a mini one (very mini!). This is from Crumbs & Doilies’ regular Thursday slot in Covent Garden. Other things that help make birthdays truly special are lots of lovely messages from kind friends, fabulous presents (more on this another time), gorgeous sunny afternoons shopping and chilling and fantastically talented friends who decide to have gigs on the day of your birth. Good times.